Can you believe that Fall is almost here and that the holidays are right around the corner? Now is a great time to start stocking up on supplies and honing your jewelry-making skills. I'm working on my web store so, in addition to my Etsy store, you'll soon be able to buy your jewelry-making tools and supplies right from my website. Many of you are customers of my Etsy store and I really appreciate your business. I've got some great new classes and workshops coming in the Fall and Winter sessions. They're always fun and I'd love to see you at one or more of them! I've released some great new tutorials, including the long-overdue Beautiful Bead Caps. This detailed two-part tutorial shows you how to make the caps and use tubing to rivet (core) them to your lampwork beads. For those of you with busy schedules who just don't have time for 6 weeks of classes, my 2-day Wire Jewelry Fast Start may be just what you're looking for. These intense classes are held over a full weekend and will give you a great foundation to get you well on your way with basic wire working. 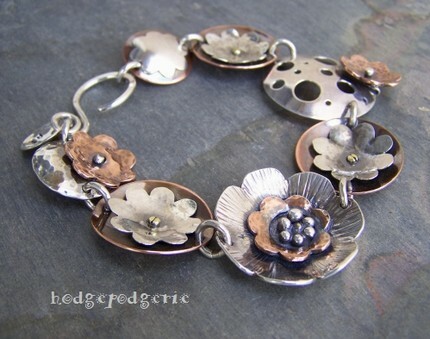 "Industrial Metals" and "Riveting Pendants" are new workshops for the Fall. 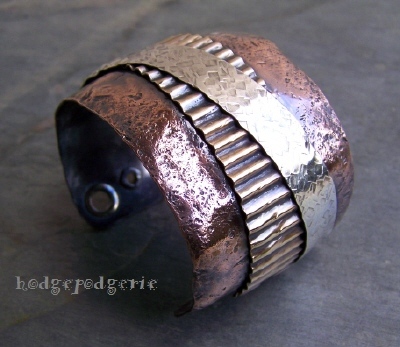 Both have an emphasis on texture, surface embellishments and cold connections. There is also now an interactive Jewelry Q & A section my website which allows you to ask (and comment on) wire and metal jewelry-making questions. Check it out, ask questions and share your knowledge! Cold connections are more popular than ever. For "On The Wire" subscribers only, here's a free mini-tut on Making a Tube Rivet. It's one of my favorite kinds of connections. This versatile cold connection can be used to put together multiple layers or to re-inforce a hole punch in a piece of metal, or simply as an embellishment to add a little pizzazz to your metal work! As mentioned above, we'll soon be adding a variety of tools and supplies to my website, including sheet metal and stamping shapes. I'll also be offering some specialized money-saving kits where I've done the legwork for you and put together the tools necessary for certain applications, such as bead cap making, stamping metal, etc. I'll have both materials kits for some of the tutorials and tool kits. If you haven't been to my Etsy store hodgepodgerie Necessities recently, you're missing some great new additions. I'm especially excited about Eurotool's new 9-in-one texture hammer. I've found that the 3/4" texture faces are very easy to swap out, making it a very versatile and enjoyable tool to use. 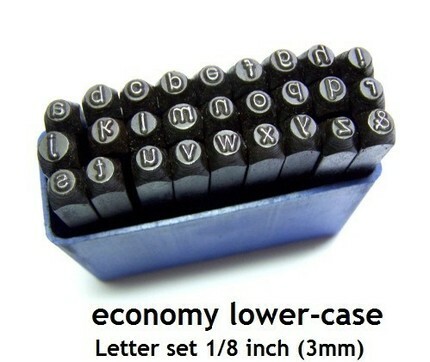 GREAT DEAL on lower-case Economy Letter Stamps in my Etsy store! They're already on sale for $10 off the regular price. Mention you're an "On The Wire" subscriber and receive an additional 5% off the sale price! Just email me after your purchase and I'll refund your 5%. Offer good only on in-stock sets while they last. Tool Tip: A good pair of flush cutters is an essential tool in jewelry making arsenal. Flush cutters give you a straight edge on one end of your cut wire. You'll want to take good care of them to ensure years of good service. Use these cutters for non-ferrous metals only such as copper, silver, brass or gold. DO NOT use them on stainless steel or steel wire, iron, memory wire or the popular nylon-coated beading wires, as the cutting edge can very easily be ruined. 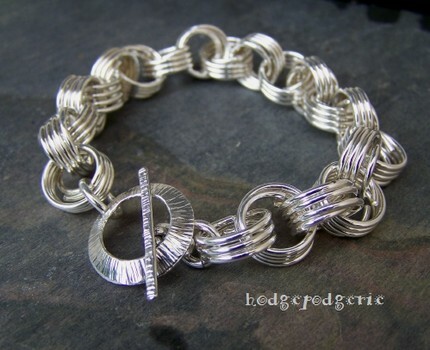 In addition to the jewelry available on my website, I've opened a new Etsy store called hodgepodgerie Adornments. Check it out. Exclusive offer for e-zine subscribers: 15% off any finished jewelry piece from either my website or Etsy store. Email me after purchase and I'll refund your 15%. Offer good through September 30th only. I hope you enjoyed this edition of "On The Wire." If you have specific interests that you'd like to see in future editions, please let me know. All comments and feedback are greatly appreciated.